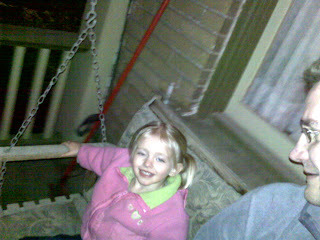 Most nights when we get home LM likes to climb up on the swing and then pat the seat next to her and say "Sit, Daddy, sit!" So then we'll sit in the cold and swing. She gets mad at me if I ask her questions about her day or try to sing songs so we just sit and hope the moon comes out. 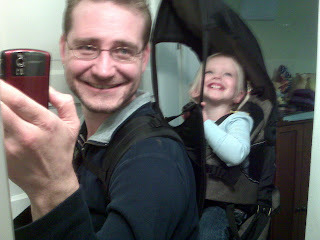 So here's Love Monkey in the ba'pack she likes me to take her around in. We have a better camera than my camera phone, but it's a Sony so has a non-standard USB cable which irritates me to the point that I seldom use it. The cuteness of these pics and your stories makes me want to cry. Jesus, I am a nerd. Thanks for sharing. I am grateful for every peek into your adorable daughters life.